MANILA, Philippines - Last 07 February 2014, PNoy waited in line at the LTO (Land Transportation Office) in Tayuman, Manila to renew his driver’s license, two days before its expiration on his birthday tomorrow. Newly promoted Undersecretary Rey Marfil, who accompanied the President along with Transportation and Communications Secretary Joseph Emilio Abaya, said people applying or renewing their driver’s license were surprised to see the President waiting for his turn. It was the second time that Aquino personally went to the LTO office to renew his driver’s license since he assumed office. The first time was at the LTO main office in East Avenue in Quezon City in 2011 when former LTO chief Virginia Torres accompanied him. Lily Cadores, licensing center chief at LTO-Tayuman, said Aquino insisted on not being given VIP treatment. “He personally inquired with the customer service and waited with the crowd. While waiting for his turn, there were people asking to have their picture taken with him. His queue number was 84,” Cadores said. PNoy also went through the process of having his photo taken using the computer cameras and signing the signature card. According to the Routing Slip of the LTO, the total processing time for Aquino’s license was 26 minutes, or from 10:32 to 10:58 am. 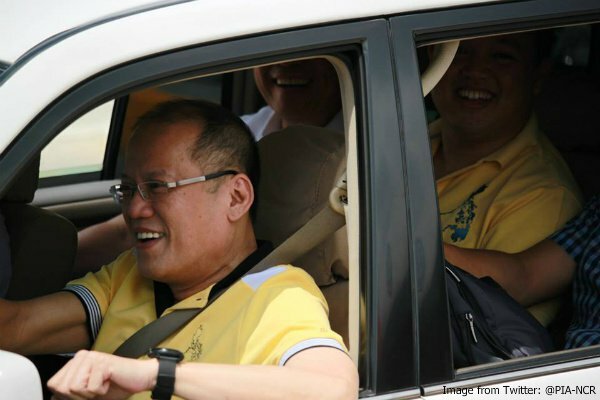 PNoy likes to drive even if he is now the country’s chief executive. 26 minutes lang? wala pang VIP treatment? bakit kami ilang oras inaabot? 26 mins lang? samantlang ako may tumulong pa sakin non ah? umabot ako ng buong maghapon tapos sya ganun lang katagal wala pang kapit? Ayos! dinaig mo pa nagpafixer. Baka may license card na yan.